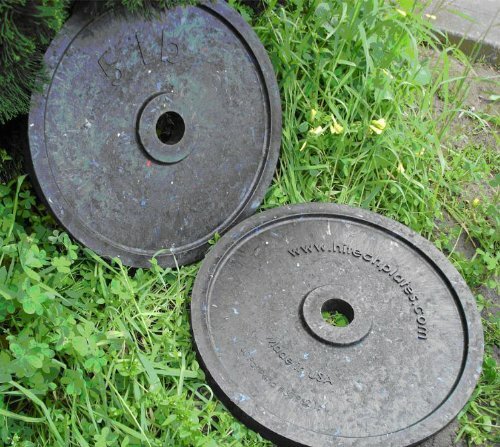 Features: (2) 5 LB Technique Plates. Weight: 5 lb. each. Color: Chalky Black. Thickness: 3.25 cm. Rugged one piece solid construction deemed unbreakable on the platform. Competition size and shape. 17.75" diameter & 2" center hole - all competition bars. Fits the bar snugly with no wobble. slides on and off bar smoothly. Coach & lifter can focus on technique not damaging the plates. Never needs painting. will not rust. Less expensive than the typical technique plate. Environmentally friendly. "Green" Made from recycled materials (solid plastic). WARRANTY: Lifetime Limited Warranty. Will not replace if plates are abused. MADE IN USA.